We report the discovery that R139 in 30 Doradus is a massive spectroscopic binary system. Multi-epoch optical spectroscopy of R139 was obtained as part of the VLT-FLAMES Tarantula Survey, revealing a double-lined system. The two components are of similar spectral types; the primary exhibits strong C III 4650 emission and is classified as an O6.5 Iafc supergiant, while the secondary is an O6 Iaf supergiant. The radial-velocity variations indicate a highly eccentric orbit with a period of 153.9 days. 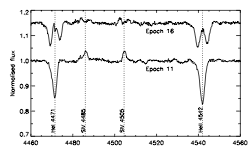 Photometry obtained with the Faulkes Telescope South shows no evidence for significant variability within an 18 month period. The orbital solution yields lower mass limits for the components of M1sin^3 i = 78 pm 8 Msun and M2sin^3 i = 66 pm 7 Msun. As R139 appears to be the most massive binary system known to contain two evolved Of supergiants, it will provide an excellent test for atmospheric and evolutionary models.